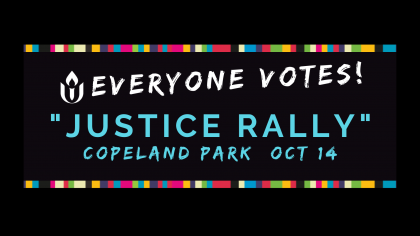 EVERYONE VOTES “Rally for Justice for Women, People of Color, Immigrants, the LGBTQ Community & Environmental Justice” at Copeland Park. Your Wisconsin friends and neighbors are counting on you to vote! Vote early at City Hall/Clerk’s Office starting Monday, October 15. You can register at our EVERYONE VOTES events this fall! This is the last in a four-part series of events encouraging everyone to register and VOTE! Please INVITE YOUR FRIENDS and SHARE on your pages! Live music from The Mayfield Experience! AND Fathead Steve’s food truck will be serving up delicious food! PLEASE INVITE YOUR FRIENDS, FAMILY, AND COLLEAGUES! SHARE SHARE SHARE!